If you’ve ever dreamed of turning your passion for Reformer Pilates into a career, or if you just want to learn more about this incredible form a fitness and the art of teaching it, we’ve got you covered. 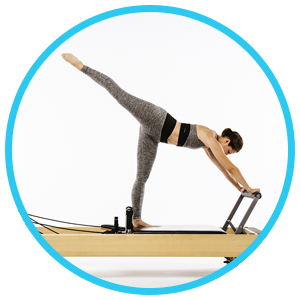 This 150 hour, modular program allows you to learn everything you need to know on the most popular piece of Pilates apparatus, with a universal certification to teach upon successful completion of the program. Learn the entire classical reformer order from beginner through advanced, exactly how Joseph Pilates created it, as well as modern, innovative and athletic exercises that are especially fantastic for group class and the entire advanced mat Pilates system. Knowing the exercises is just where we begin. Learn everything you need to know on how to effectively cue both physically and vocally, layer your teaching, connect with clients, understand music psychology, format a group class, understand functional anatomy like the musculoskeletal system, joint function and movement, special cases, and more. Upon successful completion of this 2 month program, you will be a knowledgable, vibrant, educated and confident Pilates pro with a universal teaching certification in both mat and reformer Pilates. Apprentices with Speir Pilates receive 10% off any private lessons and/or group class packages for the duration of the program. One photographic comprehensive training manual pertaining to each module registered and paid for, in-studio lecture/training with Speir Pilates Master Teacher Trainer, in-studio training with Speir Pilates specialty trainer in Functional Anatomy, use of studios for self practice, practice teaching, apprentice teaching sessions, observation, and one assessment-based diploma upon successful completion and graduation of the program and all necessary test-outs required.